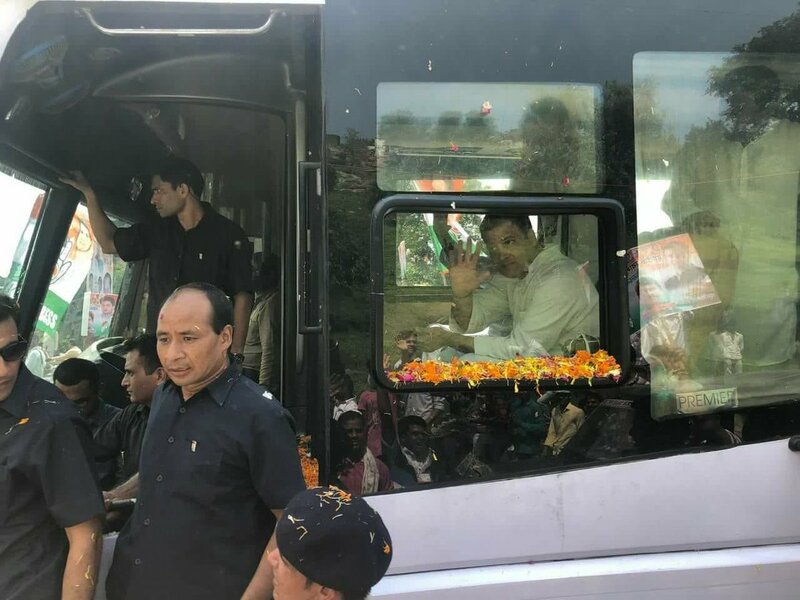 Congress president Rahul Gandhi began his roadshow here on Monday after taking blessings from 11 Hindu priests as he kick-started his party's campaign in poll-bound Madhya Pradesh. 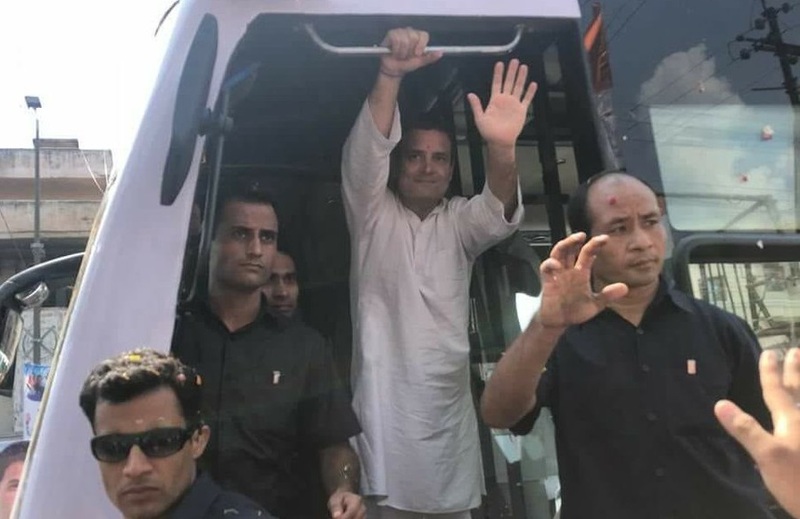 Bhopal: Congress president Rahul Gandhi began his roadshow here on Monday after taking blessings from 11 Hindu priests as he kick-started his party's campaign in poll-bound Madhya Pradesh. The 48-year-old Congress chief, whom the main opposition party in the state has been describing a 'Shiv bhakt' in banners and posters put up in Bhopal, arrived at the airport here earlier to a grand welcome. Gandhi was received at the airport by Madhya Pradesh Congress president Kamal Nath and senior party leader and Guna MP Jyotiraditya Scindia among others. As he stepped out from the airport, several Congressmen holding the party flags chanted "Rahul Gandhi Zindabad". Hindu priests, chanting mantras, blessed Gandhi as he reached the Lalgathi area, amid a heavy security cover, to launch the poll campaign in Madhya Pradesh where the BJP has been ruling for the last 15 years. Before hopping on to a bus for the 15-km-long roadshow, Gandhi performed a 'puja'. 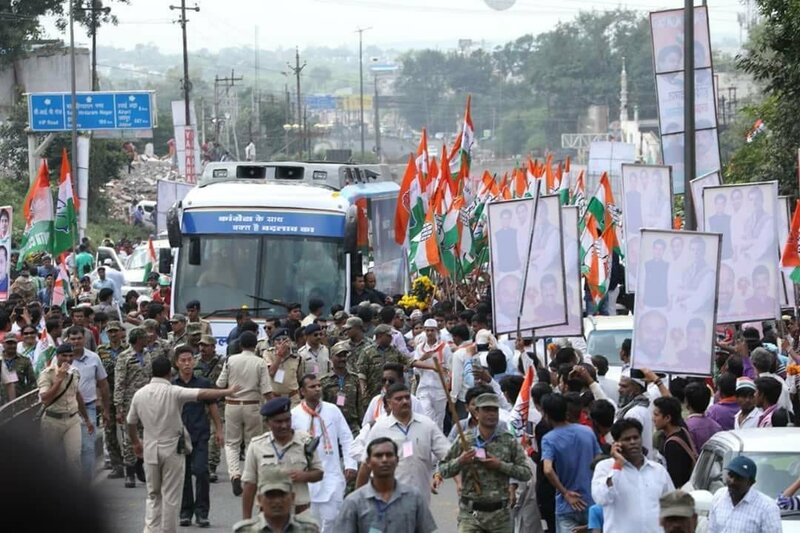 Thousands of Congressmen thronged the road sides and jostled to catch a glimpse of their party chief, who set out in the bus along with senior party leaders. Gandhi's roadshow, after passing through the main streets of the city, will conclude at the Bharat Heavy Electricals Ltd's Dussehra Maidan, where he will interact with party cadres this evening. "A T-shape ramp has been constructed near the stage from where Gandhi is going to take questions from party workers and interact with them," state Congress spokesperson Pankaj Chaturvedi said. Before leaving in the evening, Gandhi will address a meeting of Congress workers, which is also open to public, he said. Heavy security has been deployed in the areas from where Gandhi is going to pass. Besides the regular police force, an additional 1,500 policemen are manning the streets of Bhopal.